The Gaslights in Memorial Park were an initiative of the Mount Victoria Community Association Inc and they were installed as part of the celebrations of the Centenary of Federation. They were officially lit on 3rd March 2001. Gas was chosen as it is in keeping with the 19th century buildings in Mount Victoria and, at the time, was the most sustainable option. After installation the Blue Mountains City Council Inc took responsibility for the maintenance of the lights and for payment of the gas bill. In 2009, Blue Mountains City Council approached the Community Association with the idea of turning the lights off over summer as a cost cutting measure. the lights should still be on at night, even in summer. The plan has been submitted to Blue Mountains City Council staff several times and has been supported by Councillor Terri Hamilton. The Community Association estimated (in 2009) that the system would cost about $1000 to install. Two T shaped pipes (T Connections) are installed between the gas meter and the lights and the control system is contained between the T Connections. (T Connection 1 and T Connection 2). Starting on the left hand side of the plan is the existing gas line, coming from the gas meter into the proposed system. The gas enters the system on the left hand side, coming from the meter and leaves the system on the right hand side, going to the lights. A gas solenoid valve is installed on each side of the T Connections, Gas Solenoid 1 and Gas Solenoid 2. Both Solenoid valves are attached to a Circuit and Relay which are powered by a Solar Panel and/or a Battery Backup for continuous electricity supply. The Circuit and Relay are controlled by a Light Sensor. This is what controls the switching. The gas going through Gas Solenoid 1 is flowing through an unrestricted pipe and the gas leaves this pipe via T Connection 2 and back out to the lights. The gas going through Gas Solenoid 2 also goes to the lights via T Connection 2 but there is a Flow Control between Gas Solenoid 2 and T Connection 2. In daylight, the light sensor, circuit and relay closes Gas Solenoid 1 and opens Solenoid 2. This means that the gas does not flow through the unrestricted pipe, it is diverted through the pipe with a flow control on it. It cannot be turned off completely but it can be turned down so that each light is more like a pilot light. When turned down, the gas pressure is 50 to 80% and the piping acts as a reservoir ensuring the flame remains lit during switchover. At night or in overcast weather Solenoid 2 closes and Solenoid 1 opens. This allows the gas to flow through the pipe that has no Flow Control and provides full pressure to the lights and therefore the flame and the amount of light is turned up. “§ Personal safety of residents. The park is often used at night by residents who are walking home from the railway station at all times of the year and people using the tennis court, particularly in summer. Turning the lights off would mean that the park would only have lighting from inside the locked toilets, a small amount of light “bleeding” from the surrounding street lights and, when the tennis court is in use, the tennis court lights. 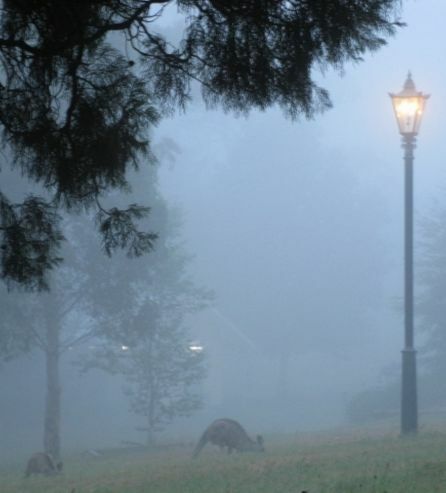 The gaslights emit low but sufficient lighting for residents to use the park safely at night and in misty weather. They allow people walking through the park to see obstacles such as uneven surfaces, park furniture and landscape features. They reduce the possibility of criminal activity by making such activities observable and by making perpetrators feel as if they could be observed. If the lights were turned off, Council would then need to ensure resident safety by either replacing the gaslights with electrical lighting or by providing a safe alternative route. Although the Mount Victoria Community Association prefers the gas lighting, we would expect it to be replaced by some form of lighting in the park while turned off for the above reasons however Council has not indicated an intention to replace the lighting with electrical lighting. Installation of electrical lighting would be at a considerable cost to Council, more than that saved by turning off the gaslights. A natural gas bill* of $5,500 @ 0.01611/MJ = 341402 MJ / 3.6 = 948834 kWh of energy. BMCC’s aim to provide role modelling for the community by reducing its carbon footprint is very commendable but according to the website http://carbonfootprintsociety.com.au/, 17.54 tonnes of carbon dioxide is produced by 948834 kWh of natural gas and 93.47 tonnes of carbon dioxide is produced by 948834 kWh of electricity produced in NSW. Natural gas lighting is therefore a very sustainable way to provide public lighting and is consistent with Council’s aims to provide role modelling for the community sustainability. The low levels of lighting are sufficient for the purpose they are serving. The park does not need flood lighting and stronger lighting could result in light pollution, disrupting wildlife and making it difficult to observe the night sky. The lights feature in promotional material for the town and its businesses. It would not reflect well on our community if an advertised attraction is not actually working for part of the year. We also believe that BMCC and other local agencies involved in tourism marketing could be taking greater advantage of the gaslights and the old fashioned atmosphere they emphasise in our 19th century village as an attraction to the Blue Mountains than is currently the case. A possible grant to fund this was found but on further investigation by the Community Association, it had to be applied for by Council. On contacting the Council it was found that the grant had already been received for another purpose and could not be received a second time. In 2012 a photo of a gaslight when the park was covered with snow was posted on Facebook. This triggered questions about the strong smell of gas resulting from poor maintenance and broken mantles which in turn has resulted in suggestions about what action we can take to have the lights fixed, properly maintained and our proposal implemented. We continue our requests to Council to have a decision made about our proposal and ask that residents contact Council whenever they notice that the lights are damaged, need new mantles or are not functioning properly. If you would like to become involved in the Mount Victoria Community Association Inc, we meet at St Peters Church Hall on the 3rd Monday of the Month at 7.30pm, except for December and January. You can also apply to join us online.